Expanded, customized, CHC, with full covered front porch. Great Room feturing tray ceiling, arched windows, dual fireplace shared with family room. Spacious Open Floor Plan. Office on 1st floor. Beautiful kitchen with center island, pantry, open to family room with half wall. Sliders to deck. Formal Dining room, full, walkout finished lower level with recration room. 3 car garage. 1+ Acres of park like property to view form the 12' x 18' deck or relax on the 14' x 15' ground level, paver patio. Locted in popular Sharmel Woods East. Convenient to Brundage Park and Randolph Trails. 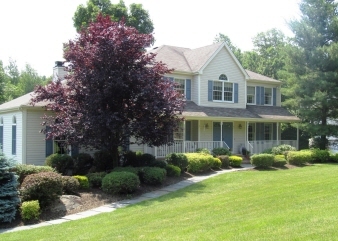 Close to shopping, highly rate Randolph schools, easy commuting location.